Mixed Salad Annie: Left-over Grilled Chicken... Re-Invented! I made a few posts back? Well I had leftover dip and decided to put it to good use. The day after I made the Crostini, I made grilled chicken on my new grill pan. Which by the way I love, even though it smoked my house out. Anyway, I decided to make a pasta dish with the leftover grilled chicken and crostini dip. 2. I cooked some whole wheat penne and reserved some of the pasta water. 3. I put the pasta in a serving bowl and used the same pot that I cooked the pasta in to heat up the dip to which I added the reserved pasta water. 4. 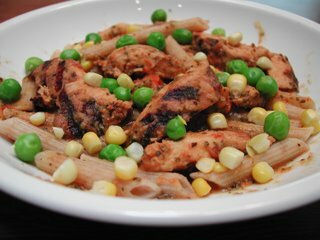 I added the left-over grilled chicken to the dip to re-heat for a few minutes and poured it over the pasta in the serving bowl. 5. I added the peas and corn to garnish and dug in. The dip actually made a really good sauce for my pasta. I almost forgot I was eating whole wheat pasta. By heating the dip and adding the pasta water, it really toned the raw garlic flavor down and it was excellent. There was no need to add any other flavorings, spices or even oil since the dip had it all. I think I actually liked the re-invented chicken better than the original. Do you have a favorite "re-invent" recipe for any of your left-overs? We don't get too many leftovers around here. I'll freeze most leftovers to enjoy down the line. I had stuffed shells for lunch today and the chunky tomato sauce was even better after having been frozen. Back when I cooked freestyle, I know I 're-invented' a few things but I'm drawing a blank right now.